You may have noticed people talking about shirataki noodles lately. These noodles are made out of vegetable fiber, and they contain virtually no carbohydrates, but they have a texture and consistency vaguely similar to noodles in the mouth. To be honest, they’re a little bit chewier, almost crunchy, but not quite. In my opinion, when you want something with noodles, they’re a good alternative. Last night my husband made me beef vindaloo curry with broccoli and mushrooms, and in order to bulk it up, we decided to insert some shiitake noodles. What are the advantages of using shirataki noodles in something like a vindaloo dish is that the curry itself tends to be very spicy, so there’s a lot of room for stretching the flavor across something bland like a noodle. 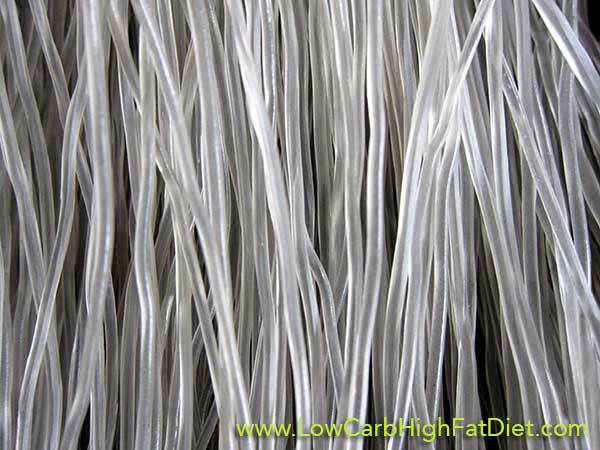 Using shirataki noodles can be a little bit tricky. They come in a soft state, packed in water, and the water has a kind of funny smell. Sometimes it smells more tart and tangy, sometimes it smells a little fishy. It’s hard to predict what you’re going to get. The important thing is to rinse it very carefully. We put the noodles in a very fine strainer, and dunk them in several changes of water, stirring them vigorously. You have to wash them a lot, because they absorb that packing liquid flavor. What you want them to absorb is the flavor of the sauce you plan to put them in. After we rinsed them thoroughly, we decided to chop them into pieces. One thing I’ve noticed about cooking with shirataki noodles is that they tend to clump together. And when I say they tend to clump together, I mean they are unusually attracted to each other. Sometimes when I’m eating them, I find that the sauce is all on one side of the plate, and the noodles have all formed in one gelatinous mass at the other side of the plate. Individually they come apart easily, but it’s very difficult to pick up only a few without getting the entire lump. In order to combat the stickiness of the noodles, we decided to chop them into pieces before cooking them. They’re very soft, so you could do this with a knife, or with scissors the way we did. The thing to be careful of is that they tend to be very slippery and fine as well. If you don’t use a very fine strainer, you’ll find a lot of your noodles going straight down the drain while you’re trying to rinse them. After you have the noodles rinsed, the best time to add them to a dish is after it’s been cooking for a while. The recommendation on the package is usually that you boil the shirataki noodles, or pan fry them, or at least 2 to 3 minutes. I find that if I add them to a hot stew in the last five minutes of cooking, they take on the flavors very well, and they cook through thoroughly. If you’re expecting them to be just exactly like egg noodles, you will be disappointed. They’re more like cellophane noodles you might find in an Asian grocery store or restaurant. Since they contain no flour, they are quite rubbery and stretchy compared to traditional pasta or noodles. However, they make an excellent complement to a lot of dishes. Ideally, don’t think of them as a strange type of noodle. Instead, think of them as a better substitute for spaghetti squash. I’ve used shirataki noodles in soups, stews, and also as a side dish for meats and savory vegetable dishes in place of rice. The best place to use shirataki noodles tends to be in something that has a lot of flavorful sauce, so you can lose the noodles in the disj and let them provide bulk to the meal. If you eat them plain, they have practically no flavor, so you want to give them a sauce that has some spice to it rather than a bland one. Shirataki noodles should not draw attention to themselves. One thing I’ve thought about trying with shirataki noodles that I haven’t tried yet is boiling some the night before, and then refrigerating them and chopping them up to serve in a salad. I think they would add a nice texture and variety to an interesting salad, maybe with some sesame oil and peanut dressing and some sunflower seeds. If somebody gives that a try, please let me know how it is. You know that I’m not big on substitute foods. However, shirataki noodles are so unlike regular noodles that I don’t really consider them a substitute. Shirataki I noodles are their own special food type, and I use them in ways that I wouldn’t use a normal pasta. Give them a try, and let me know what you think.